Here is the FINAL Final Fantsy for the year. Game be epic, yo. Took ages, but here it is. Here's the link to Orinocou's web-comic. Highly recommend it! Also, I found a fan-made anime of Final Fantasy VI on YouTube. It's surprisingly high-quality for something completely unofficial. Just goes to show how much people love these characters and story. I'm always changing my mind about what my favourite Final Fantasy game is. 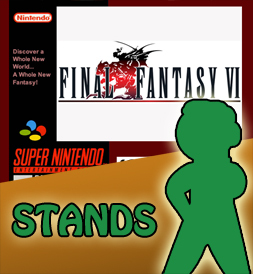 It's definitely gotta be between FF6, FF8 and FF9. FF7 started off amazing but went crap in the second half. FF10 traded good characters and plot for voice acting. That, and it started the whole "run-in-a-straight-line-to-the-finish" mentality. FF12 was amazing, but hardly felt like a Final Fantasy game at all. still got solar jetman on your todo list? i loved it both as a kid and adult but i have a sneaking suspicion that my adult love of it was nostalgia tainted.